It’s not that the brokerage hasn’t taken into account the big margins surprise of the June quarter and upgraded earnings of many firms, like most brokerages have. It’s just that their downgrade of Reliance Industries Ltd’s earnings estimate for the year wiped away the cumulative effect of all other upgrades. Kotak downgraded its FY10 EPS estimate for Reliance by 8% to Rs103, owing to lower assumptions on refining margins and production of oil. Most analysts were negatively surprised by the reported refining margin for the company and its oil production levels, but very few have downgraded earnings estimates. It’s important to note here that earlier in the year, Reliance’s earnings were expected to drive aggregate earnings this year thanks to the commencement of its gas production. Brokerages that have seen an increase in their Sensex EPS targets for the year have likely left their estimates for Reliance untouched, despite the evident negative surprise in the results. In any case, the upgrades aren’t material. 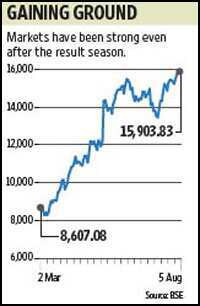 Citigroup Research, for instance, had estimated Sensex earnings to be flat before the results season began, but now expects a growth of about 3%. Most of the surprise in the June quarter earnings was on account of higher -than-expected margins, and the outlook on this front isn’t that bright considering that commodity prices have picked up considerably thanks to the increase in the global liquidity situation. Indian companies would also soon have to contend with the fallout of a weak monsoon. And a few companies such as Tata Motors Ltd and Hindalco Industries Ltd that beat street estimates have to still report consolidated results, which are expected to be half as exciting. While the markets have been strong in the past month owing to strong liquidity conditions, there’s certainly not enough in corporate results to justify this rise.